Scouting facing major crisis: Watchdog - SCOUT eh! Hudson — The Canadian Scouting movement is on life support and may not be able to live much past next summer's centennial celebrations, warns Scoutmaster Doug Peets. This past Saturday, Peets joined two dozen other Scout eh! members in a Rally to Rescue Scouts Canada outside the organization's national headquarters in Ottawa. Nobody from the organization met them. "I'm a strong supporter of the Scouting program," Peets said Monday. "I'm not a doom and gloom guy, but the Scouting program at the provincial and national levels is, at best, in very dire straits and in real jeopardy of collapse. We have to ask some serious questions about how it's being run." Scout eh! believes Scouts Canada is being crippled by a top-heavy management propped up by a closed-circuit board structure. "[Management] has become non-responsive to the needs of the rank and file," says Peets. "The vast majority are volunteers, but because their management system has become unaccountable, they've become complacent, unable to respond to changes." He's careful to emphasize the positives about the movement that Lord Baden-Powell founded 100 years ago next year. "One thing that Scouting does that other youth programs don't is focus on character, teach young people to take responsibility for their own decisions. Scouting has a long and distinguished history in Hudson. We still have active leaders who have been a part of the organization for more than 20 years." Peets readily admits he's a relative newcomer. "I founded a new Scout troop, 1st Cavagnal Scouts, three years ago when my own son was ready to move up from Cubs. Now, after only three years, we have the second-largest troop in Quebec, with 25 registered youth members and six adult leaders. Our program has grown every year, and I attribute our success to the quality of our program activities and the commitment of our leaders. The latter leads to the former." Next summer, Scouts around the world will be holding events to celebrate the 100th anniversary of the movement's creation by Lord Baden-Powell. Here in Canada, events will centre on a national Canadian Jamboree, CJ '07, to be held at Camp Tamaracouta in the Laurentians, the oldest continuously-operating Scout camp in the world, having opened in 1912. A decline in membership. In 1990, total membership of adults and kids was 265,0001 265,000. In 2000, it was down to 188,000, a loss of 77,000 or 29 percent in 10 years. From 2000 to 2005, it went down to 110,000, a loss of 78,000 or 41 percent in five years. As of August 21, membership has dropped to 102,000, a loss of another 8,000 or 7.3 percent just this year. "The reasons for this decline are varied, but Cavagnal is an illustration that the program can grow," says Peets. "Certainly, Scouts Canada has not responded effectively to this challenge." Top-heavy management. Scout eh! points out that in 1968, Scouts Canada had one employee per 800 kids. Today, they have one per 400 kids. 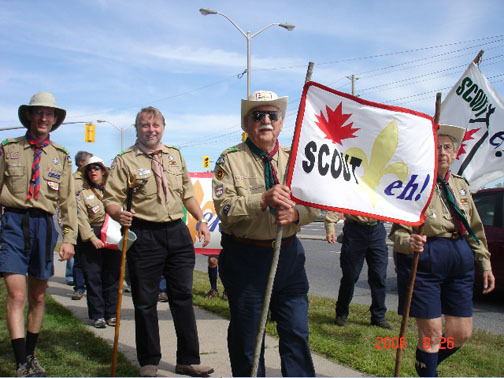 Scouts Canada's 2005 national payroll was $3.5 million, not including the provincial councils (another $7.5 million) to manage an organization which is substantially run by volunteers. National headquarters has been losing about $1 million per year over the last four years. It has already emptied over $2 million from the Youth Event Fund for jamborees and last year, took $700,000 from the insurance fund. At the end of the August 31, 2005, fiscal year, Scouts Canada declared an operating loss for the year of $568,000, which, combined with the balance of the losses from the restructuring costs, brought the total losses for the year to $1,035,000. Lack of accountability or democratic recourse. "Scouts Canada has organized its internal policies and its bylaws such that ALL responsible positions, from Provincial Council, to Area Commissioner, even to Group Commissioner are now appointed positions, so it is hard to replace the current appointees," Scout eh! notes. For more on Scout eh! 's concerns, go to http://scouteh.ca. For more on the Scouting program in Hudson, go to http://www.HudsonScouting.com.